"Son of Man can these bones live?" 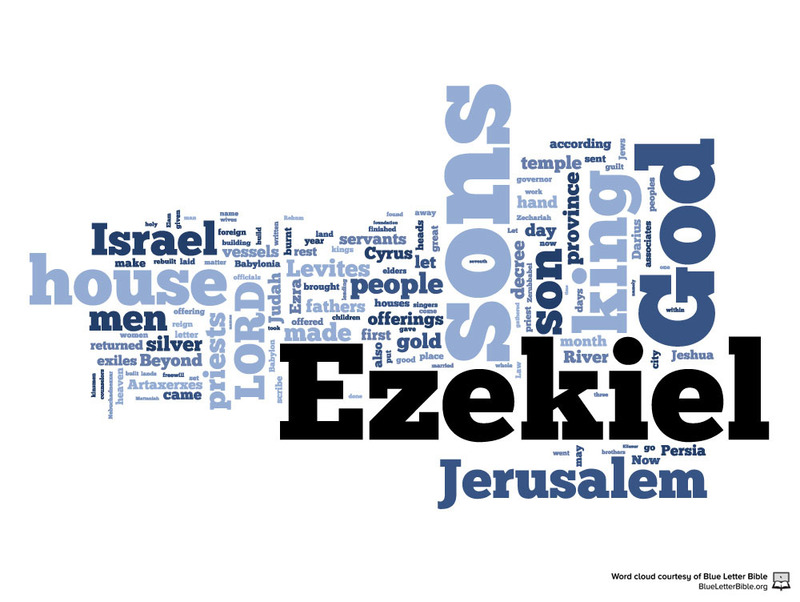 Ezekiel was asked and amazing question and shown an amazing prophecy by Almighty God. It's a question with many levels of fulfillment. On one hand, it speaks to the promise of resurrection. On the other, it speaks to the restoration of the Jewish people in their homeland. It includes the dry, parched land of Israel that has now blossomed into orchards and vineyards following the fire of the Shoah, the Holocaust that miraculously brought life to the dry bones in 1948. If you do not see this, get rid of the blinders. The House of Judah are in Israel to restore the Promised Land for the promise of the coming of Messiah. The eretz-land requires some cultivation and preparation for the millennium Olam Ha-Ba aka the World to Come. Yet there is more. People need to be prepared as well. A mixed multitude came up from Egypt. That's the fact. Ezekiel unveils this mystery as well. Peshat = "surface" or the literal direct meaning. Remez = "hints" or the deep symbolic meaning beyond just the literal. Derash = "inquire" or seeking the comparative meaning, as given through similar occurrences. The "Sod" or hidden mystery of Ezekiel's vision brings life to the "bones" which in a "Sod" inspiration or revelation can be considered the Torah. They were not broken like Yeshua and they do not rest in peace. Bringing life to the dry bones of the resurrection of Jesus the Jew in the body of Messiah is a hidden part of the prophet's vision and a part of the question: "Son of Man can these bones live?" In the second century, the so-called church "fathers" changed Messiah's identity when they turned against the Jewish people as they planted the bad seeds of replacement theology and ate the fruit of the tree we now know as anti-Semitism. The Jewish people play a huge of the prophecy parable of Ezekiel 37. It started in 1948 but shifted into second gear in 1967 when Jerusalem, the place of God's name was restored to the Promised Land as the Polish born Chief Rabbi of the IDF, Shlomo Goren blew his shofar at the "Kotel" aka the Western Wall announcing the the liberation of the Old City of Jerusalem as the IDF's General Motta Gur announced to the troops "the Temple Mount is in our hands... I repeat, The Temple Mount is in our hands". Incredibly, after the Six Day War and in the years that immediately followed, many Jews came to see Messiah for who He was and is following the Holocaust as the breath and Spirit of God was now breathing on them. Jesus the Jew was being revealed as Yeshua HaMachiach despite the fact that some 1,800 years earlier, Christian pulpits had disguised Jesus Christ as a counterfeit when they hung the same Scriptures He taught every Sabbath in a synagogue on a Roman cross. The Greco-Roman "fathers" even painted Him with blue eyes and a halo above His head imported from Mithraism in their church frescos. But after 1967 and the liberation of Jerusalem and the Temple Mount, something shifted. There was a change a restoration of Jesus as Yeshua. The shift was to the front of the book. It was as if it too was liberated. Many Christians that had read the front of their Bibles began to understand that the Torah, the Prophets and the Writings were not lying dormant in the dust of time, the dry bones had begun to come back to life. After all, bones provide the strong structure and living foundation frame of the human body. Bones allow us the ability to live life to the fullest. They give us the physical ability to crawl, to walk and run. Thinking in "Sod" mode let's reconsider the bones of God's Word. They are the hidden framework of teaching and instruction for life in The Kingdom. God's words give the ability to live life to its fullest as it was and is meant to be. They give us the spiritual ability to crawl, to walk and run. But somehow they lost life and dried out in the early Greco-Roman church, they were baked in the Sun if you will, by the body of Christ as they lost the Ruach Spirit of God. The bones dried up in the church dust, but now they are being awakening and restored to new life in a remnant of Believers. Incredibly, the Torah, the Prophets and the Writings were never dead bones to Judah. Without knowing it they believed the words of Yeshua: "not one jot or tittle of the Torah shall pass..."
Many of the early church fathers turned their back on Jesus and His promise. Men like Marcion rejected the Hebrew Scriptures, saying they were old and done away with, ready for the boneyard. Sadly, in a way, some seminaries became cemeteries for God's Word calling it done away with, an Old Testament. Over time pulpit preaching distorted and misinterpreted Torah teaching. Not only that, the Prophets and the Writings were re-arranged to fit God's words into their belief that God changed His mind and started a new religion not realizing men make up religion as their own perception of reality. Elohim God is one, He is the Almighty, He is the creator, He has no new religion from the words of men. If we take a short trip back in time to England in 1604, we can find that King James sponsored an English translation of the Bible for the Church of England to replace the Geneva Bible and the Bishop's Bible that were already in use and circulation. King James' version was published in 1611, yet some of the King's commissioned translators missed the mark on some of the Hebrew words. Their version had some influence from the pews and podiums of the Church of England. In a way, the leg bone got confused with the hip bone and the living bones, the foundation of the living Word of God dried out in the church dust as it became known as an Old Testament as the church fathers ignored the words and witness of Yeshua about the jots and titles of God's Word. Think back to the Exodus. "God will surely take care of you..."
When the families of Jacob escaped Egypt, "a mixed multitude also left with them" (Exodus 12:38). Many were from Egypt and the nations of people that wanted to follow Joseph's bones, the sons of Israel and God's Glory. In Exodus 13:19 we see that Moses was a surety to Joseph. He honored him and Moses took the bones of Joseph with him following the cloud and the Shekinah glory pillar of fire of Almighty God as The Lord God of Israel fulfilled the words of Joseph and took care of his brothers. Joseph wanted to be brought out of Egypt, in his heart of hearts, he understood the resurrection power of God's glory. Yet, Moses never buried the bones of Joseph, which the sons of Israel brought up from Egypt to Shechem. Today, his purchased burial place has been turned into a Muslim Mosque. The men there will be shocked one day when Messiah returns and Joseph's bones are restored in resurrection life. In Ezekiel 37, the vision begins when the hand of Almighty God sets Ezekiel down in a valley full of bones and the Ruach Spirit of the Almighty gives flesh to them before the eyes of the prophet but the restoration required that Ezekiel do something so that God would give them life. "O dry bones, hear the word of The Lord (Y-H-W-H)! Thus said the Lord to these bones: I will cause breath to enter you and you shall live again. I will lay sinews upon you, and cover you with flesh, and form skin over you. And I will put breath into you, and you shall live again. Ezekiel did as he was told, and he declared "shema" (hear and do) the word of The Lord and He will put breath (His Spirit) into you! Following WWII, the bones of the Jewish people began to come together and to grow with sinews and flesh, but the mixed multitude was not with them this time hearing and doing the word of God. But remember what God told Ezekiel? The amazing thing about this prophetic passage is the fact that the four winds point toward the nations, the strangers and sojourners like those that went up with the sons of Israel long ago to follow Moses and hear the word of The Lord in the wilderness of Sinai! Bringing life to dry bones is what began to happen after Jerusalem was restored. Incredibly, many Christians began to awaken and understand that God does not change and therefore Jacob was not consumed in the German furnace fire. The dry bones that said that God's Word is old and done away with, hung on the cross began to realize they were dead wrong. Slowing but surely, a remnant of Christians began to realize there are Ten Commandments, not nine. The Sabbath of the Lord was not changed by the church fathers. They began to awaken to the Feasts of the Lord. They began to see them as Almighty God's appointments for mankind's redemption and a big part of the restoration plan for the Kingdom of God. Not only that, some Christians began to realize that the Creator God of life gives us some simple BBQ guidelines and that the grill is no place to smoke a vulture, bake a ham or fry catfish. God's teaching and instruction are easy, a light yoke for health and long life. The reason, God loves us. Let's look back again at the valley of dry bones. A part of the "Sod" answer transforms the vision of resurrection into a vision about the restoration of the bones of Ephraim and the bones of Judah as one new man restored to serve the God of Israel and shema (hear and do) the words of the Lord as one people, the children of God. “Son of man, these bones are the whole house of Israel." "Then you will know that I am the LORD." The Hebrew word there is "kol" כֹּל meaning totality, everything. Those sticks are the living bones of the prophecy and there's more life to come to the bones by the Spirit of Almighty God. “My servant David will be king over them, and they will all have one shepherd; and they will walk in My ordinances and keep My statutes and observe them. They will live on the land that I gave to Jacob My servant, in which your fathers lived; and they will live on it, they, and their sons and their sons’ sons, forever; and David My servant will be their prince forever. I will make a covenant of peace with them; it will be an everlasting covenant with them. And I will place them and multiply them, and will set My sanctuary in their midst forever. My dwelling place also will be with them; and I will be their God, and they will be My people. Those are the Gentiles that will know The Lord sanctifies Israel and His sanctuary will be in the midst forever. 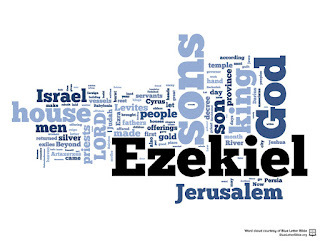 What does Ezekiel's vision teach us about God's love? Almighty God is sovereign and unchanging. He is the loving, kind, merciful, gracious forgiving Abba Father and He has provided the Torah, the Prophets and Psalms as a road map to point all people, both Jew and Gentile toward the destination of life's journey which is Messiah Yeshua - Jesus the Nazarene and living Torah. That's the vision, the bones of Torah live, they are not dead as we thought. If you have not experienced it, Almighty Elohim God is calling you to life. He wants to offer you and the world redemption, salvation remission from sin through forgiveness through Messiah and a path to walk like Him in His word. You can accept His gospel gift of life in The Father's Kingdom, its declared in the Torah, yet the bones of the Torah require the breath of God's Spirit. So, consider carefully what your own life can be like, look at it and repent of any wrongdoing, depravity, immorality or transgression sin. Ask Elohim God for His grace in forgiveness and accept His gift of love, grace and supplication through Messiah Yeshua. Then walk in new life with Him. "For God so loved the world, that he gave his only begotten Son, that whosoever believeth in Him should not perish, but have everlasting life. Today is the time, open your eyes if you're in the valley of dry bones and recognize Messiah beginning from Moses and from all the Prophets and the Psalms. Repent and walk your life's road with Messiah and study the Scriptures He taught that are filled with meaning because of Him. Not one of them is broken." Scripture reveals that if we consider ourselves the body of Messiah, we must walk as He walked, no bone of the Word of God is to be broken. Yeshua lived a Torah life. This is represented by the bones of Yeshua in His Passover death as the lamb of God resurrected on First Fruits. When God gave His word in Exodus 12:46 for the Passover lamb against breaking any bones of the lamb that given for each household, He did this for a reason. John 19:31-34 tells us that when the Roman soldiers came to speed up His death by breaking the bones of his legs, His walk, they found that he was dead, so they pierced his side to make sure and they never broke a bone in His body. In the same way, don't be like them, honor the Word of God, don't break it like an old bone. To the last detail, Yeshua fills the Torah up with life and meaning. For truly I say to you, until heaven and earth pass away, not the smallest letter or stroke shall pass from the Law until all is accomplished. The dry bones testify of Messiah. His name is Yeshua - Jesus of Nazareth and His name expresses both his identity and his mission to save us from sin's dry bone death grip. "O dry bones, hear the word of The Lord Y-H-W-H! It's now time to become one with Judah in God's hand. "These are the appointed feasts of The LORD that you shall proclaim as holy convocations; they are My appointed feasts." The Lord's days begin at the evening. At creation there was evening, then day... it's God's way. "For six days work may be done, but on the seventh day there is a sabbath of complete rest, a holy convocation. You shall not do any work; it is a sabbath to the LORD in all your dwellings." "In the first month, on the fourteenth day of the month at twilight is the LORD’S Passover." ‘Then on the fifteenth day of the same month there is the Feast of Unleavened Bread to the LORD; for seven days you shall eat unleavened bread." "You shall also count for yourselves from the day after the sabbath, from the day when you brought in the sheaf of the wave offering; there shall be seven complete sabbaths. You shall count fifty days to the day after the seventh sabbath; then you shall present a new grain offering to the LORD." "In the seventh month, on the first day of the month, you shall have a sabbath-rest, a memorial of blowing of trumpets, a holy convocation." “Also the tenth day of this seventh month shall be the Day of Atonement. It shall be a holy convocation for you; you shall afflict your souls...And you shall do no work on that same day for it is the Day of Atonement." "The fifteenth day of this seventh month shall be the Feast of Tabernacles for seven days to the LORD." "Rejoice before the LORD your God seven days." "Also... you shall keep the feast of the LORD for seven days; on the first day there shall be a sabbath-rest, and on the eighth day a sabbath-rest." A Wake Up Call !! Hosea Warned About Animal, Bird and Fish Deaths… "at that day"
Do as the Disciples - Count the Omer! Don't Be a Victim of Identity Theft! Who Were the Legions of Rome? Scripture study is not enough. Don't refuse Him. You can choose "the way" of eternal life in the living word of Elohim God through Messiah Yeshua. Not only that, you can do what Jesus did by walking in "the way" of His faith (see 1John 1:7; 1John 2:6 and 2John 1:6). If you do not know Yeshua, you can. Repent of your sin and call out to Jesus now in prayer. Ask the Messiah of "all Israel" to be your Savior King. Then open you Bible and study and examine "the way" of life that He taught. Yeshua was born in Bethlehem, Israel. He grew up in Nazareth and taught the meaning of the Scriptures, the Torah, the Prophets and the Writings as was His custom every Sabbath in the synagogues of Galilee, along the hillsides of Judaea and Samaria and at the Temple courts of the House of Prayer for all nations in Jerusalem. You can follow "the way" of the living Messiah, the choice is yours and the Bible, all of it is your guiding light and living water. I pray that something here will help you along the way to separate the new wine of men's traditions from the old wine of God's truth revealed in the Scriptures. Remember, Jesus is a Jew. He humbly gave His life on Passover and was resurrected to new life by God's glory on First Fruits to overcome death and its sin penalty. He ascended to the realm of Heaven and will return to the planet as King of kings to fulfill the redemption plan of God ending with the Fall Feasts. He will fulfill what the sages knew about the Messiah's two-fold purpose of humble servant first and King Messiah second. Have faith, accept Melech HaMoshiach and live as Jesus lived in "the way" of life leading toward the good news gospel of the restored Kingdom of God on Earth. This repair work is the same gospel Jesus declared all across Israel and it must be shared before He will return. When you follow Messiah Yeshua, our Heavenly Father will bless you as an adopted child of God and fill you with His Spirit just as He did for the disciples of Yeshua on Shavuot - Pentecost many years ago. Almighty God pours out His forgiveness and His gifts of grace, mercy, forgiveness and loving kindness if we just repent and seek them (Genesis 6:8; Genesis 19:19 and Exodus 20:6). If you want to know God's will for your life, you need to know the Word of God. Ask for guidance in prayer and His Spirit will teach you. Get busy praying, studying and applying everything you learn from God's instruction manual. It is His Kingdom constitution. If do not have one, get a Bible, open it and start in the beginning. You will discover God's eternal teaching and unchanging instruction on how to live life in His Kingdom and be ready for your life's assignment there. The purpose of the commentaries you can find here are to provide a banner of truth pointing to the Scriptures that Moses wrote down, the prophets declared and that Yeshua Jesus lived out and taught every Sabbath. There is no claim here to have every answer, my only goal is to sound a shofar like a watchman to point you toward Godly life according to Isaiah 62:6 by proclaiming Biblical truth for anyone searching for answers. We are not to just study, but "to do" the word of God placing it above “tradition” and "theology." Messiah Yeshua's way of restoring the Kingdom of God is through a demonstration of our love of God and others. It's an eternal mission and in Hebrew it is known as Tikkun Olam "repair of the world." The goal and purpose is to bless and worship God, honor His name and shine His light of lovingkindness on the darkness found on this planet. Jeremiah 50:2 admonishes: "Declare among the nations, and publish, and set up a standard; publish, and conceal not..." So, I pray you will be encouraged and challenged by the messages from my Scripture studies. If you see anything that does not line up with the truth of the Scriptures, let me know of the need for repair. Don't take my word for anything, study the Scriptures for yourself and be like a Berean: "for they received the message with great eagerness and examined the Scriptures every day..." Acts 17:11. When Paul penned those words, he wrote about the Torah, the Prophets and the Writings, the very same Scriptures Jesus taught. After all, the Newer Testament didn't exist when the Jew from Tarsus penned his sage advice. Many like me are awakening to understand what that means. We are learning the greatest command is to demonstrate love and worship of Almighty God by walking in His ways and helping others along "the way." You "get to" walk in the way if you "choose" show your love for our Heavenly Father and others just as God's Spirit has called people to do since the beginning. Our Creator God is the same yesterday, today and tomorrow. Almighty God has not changed nor has one jot or tittle of His Word. My copyright is your right to copy, all credit to God's Word. This site uses Google Analytics. Simple theme. Theme images by stellalevi. Powered by Blogger.